Anyway, I found a seller called Make Up Pro. They have two branches and also take online orders, in case you were wondering. Which is a good thing because it was freaking expensive. So, despite the price, this is mostly a good purchase for me. While it is extremely pigmented, it tends to highlight dry patches, so I would only use this if I had a good lip day. This color draws so much attention to the lip, might as well have a pair of lips that don’t look parched like the Sahara desert. I’m thinking of doing a more in-depth review on this. Or at least do some looks that pairs this off well. We shall see! Have you tried Tom Ford’s lipsticks? What color is your favorite? 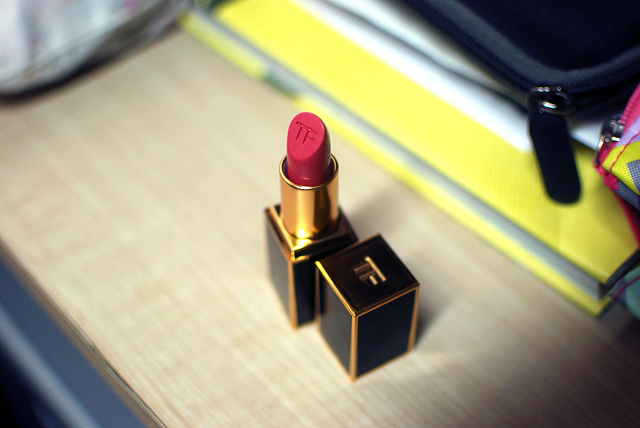 this was the lipstick that got me interested in tom ford! my first tom ford purchase was violet fatale though, bc for whatever reason i liked that shade better! i now have 6 TF lipsticks and had forgotten all about how i liked this one! Thank you, Joy! 🙂 Funny, Suqqu and Addiction are next on my list. Anyway, I got my Tom Ford items from Make Up Pro. They have physical stores, but you can get in touch with them through Facebook: http://www.facebook.com/makeup.pro.7 . I got my items online. Hope that helps! Thats great, thanks! i think you will look great in Addiction Revenge blush, a great red. Suqqu eyeshadows are so great, i know you’ll like it too. Omgawd! A TF lippie. Utter perfection! Can’t wait to see it on! Hee! I quite love it a lot, but I am a weirdo who doesn’t wanna use it all too often. I’m so jelly! Seriously, I plan to save up for a Tom Ford lippie of my own. I love it, but GAH VANILLA SMELL! I know, I’m trying to get you excited for a TF lipstick! Because I’m a horrible person. Waah! Checking out this store now! Thanks for recommending it!